We spent Thursday through Sunday visiting Grandma and Grandpa Miller. Laura was the perfect traveler, so we made good time in the car which is always a blessing. 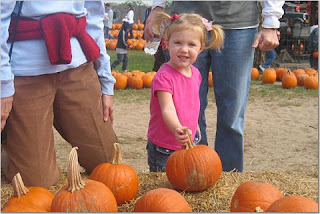 On Friday, we headed to a pumpkin patch where we all had a good time. 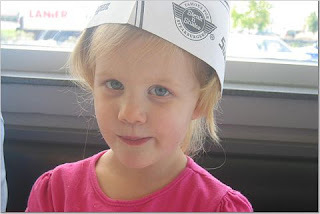 We finished it off with lunch at Steak and Shake. Jim and I had a date to Starbucks and the movies. We went all out and bought the buttered popcorn to enjoy The Bourne Ultimatum. It was a fun day! On Saturday, Jim's dad and I hit the garage sales. I love to do this, but rarely get out on a Saturday morning. I spent about $3.5o and bought shoes and a game for Laura, black Talbot shoes for me, and note cards. I was pleased. We went to the St. Louis Science Center that afternoon where I forgot to load the battery in my camera. (no pics for that adventure). For dinner, we ate at my favorite restaurant, Farotto's. It was a great weekend. Laura is still talking about all the fun. Glad you guys had so much fun. It makes all the difference when you have good travelers huh? Love the pics of Laura. She is just too cute! Glad everyone had a great weekend. I'm so sorry I missed it! Lala is growing so much its hard to believe. What a fun trip! Sounds like you guys had fun and Laura had a blast! I love the pictures of Laura! 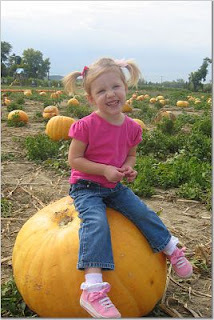 She is really cute, and the pumpkin patch looks like lots of fun. We enjoyed going to the local one this past week, too. See ya soon! This past weekend was pretty fast and furious. We did see Jordan at church though. We'll be back Thanksgiving, so I'll tell Jim to call you! Yeah, Ryan. Maybe if you'd come to church we'd see you.